Category: Feature Greenhouse Models, Free Standing Greenhouse Kits, Greenhouse Kits, $5,001 - $10,000, Pacific Series - On Sale, Pacific Series - Twinwall Polycarbonate, Twin Wall Polycarbonate Greenhouses, More..
All Pacific Series greenhouses have curved eaves. This Greenhouse kit is one of our most popular larger greenhouses, and it is on sale very day. This greenhouse is a large hobby greenhouse kit. This 16 x 20 greenhouse is perfect for those of you who need commercial space or want a larger greenhouse. Makes a great school greenhouse, farm greenhouse or greenhouse for other organizations. 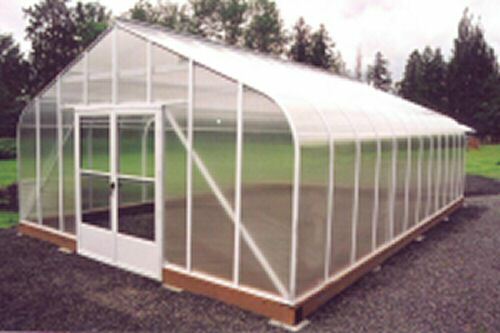 The appealing curved eaves of this quality greenhouse kit make it attractive and the extra large size allows this Seymour Greenhouse to accommodate a center bench. The 6mm double Twin Wall polycarbonate efficiently traps heat that is produced by the sun insulating it against the cold. The light transmission of this polycarbonate greenhouse is 85%, and sunlight is diffused allowing even more growing! The greenhouse polycarbonate also minimizes against interior condensation. This polycarbonate greenhouse kit is built to withstand harsh weather conditions, the durable aluminum frame comes with an attractive enamel paint finish. Large automatic roof vents provide air circulation and the wide storm/screen door comes with a key lock. This Seymour Twin Wall polycarbonate greenhouse is one of our Best Buys! It has been designed and constructed to the highest engineering standards for over 50 years! The decorative victorian trim package is optional and not included. Please see the pricing options below if you wish to add the victorian trim package. Optional door upgrades also available.